Dozens of journalists from press agencies and human rights organisations gathered today, January 15, in a march that started from the Palestinian Legislative Council’s offices in Gaza to the Red Cross headquarters, where a solidarity tent was set up in solidarity with journalist Muhammad Al-Qeq. 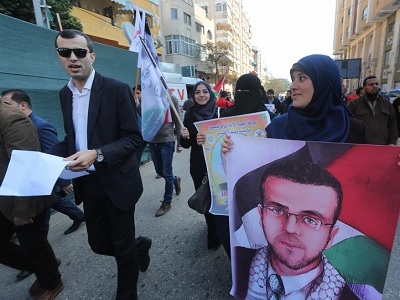 Al-Qeq enters his 50th day on hunger strike after being subjected to harsh interrogations for 25 consecutive days. He gained widespread solidarity from his fellow journalists and human rights organisations which are calling for his release before his health condition becomes fatal.